This is the time of year when the weather is finally beginning to change in Arizona and shifting into winter. Some trees are starting to change colors as they adjust to the cooler winter temperatures and others are pushing out new growth all over the place! One of the most overlooked practices this time of year by homeowners is watering and fertilizing. Maybe because of the cool weather and lower temperatures, you think less effort is needed but these are the perfect conditions to care for your yard. The November weather creates an environment that allows for the most efficient root growth (and foliage growth, depending on what type of plant you have in your yard). The weather changing also means that you must update your watering schedule to match those changes. When you are starting to trim trees or prune plants make sure to only get rid of what is needed to clean them up or to trim them back for healthier growth. A good thing to look out for are any branches that are not doing so well that might be taking nutrients from other branches around them. Pruning those branches/sections will help keep the rest of the plant strong! When you are trying to figure out how much you should cut off, a good rule of thumb is to get rid of no more than 20% of the tree or plant. 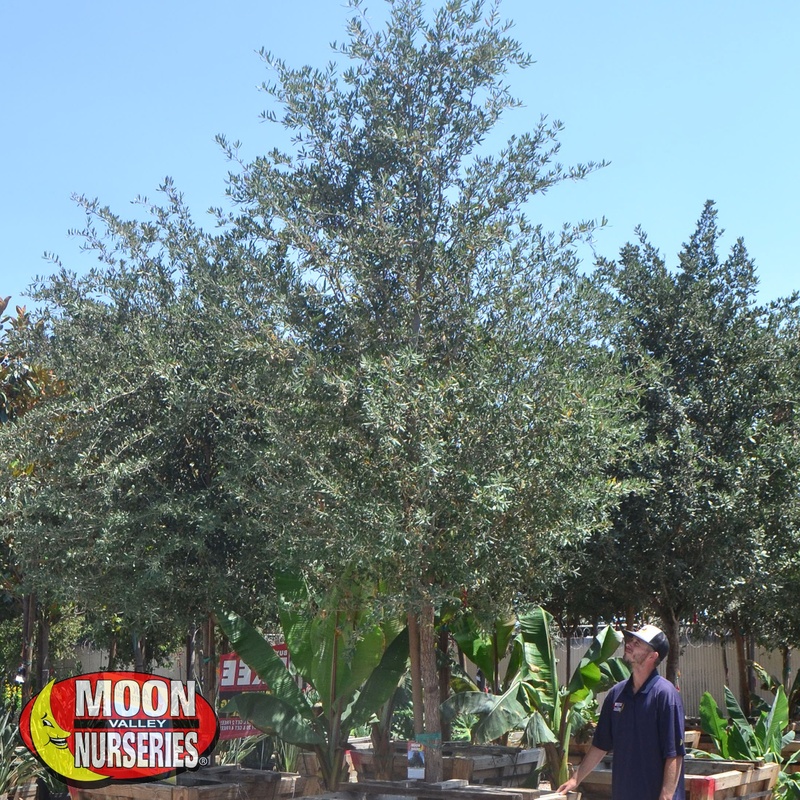 For assistance or answers to any questions you might have, please reach out to our expert tree care team at Moon Valley Nurseries! Fertilizing everything in your landscape and “hardening them up” as we say in the industry is a great way to give your landscape one last push through the upcoming winter months. Fertilizing your palms, shade trees, evergreen trees, flowering trees, and even your dormant trees now gives them the best chance of not only surviving, but thriving, through the cold winter. This extra attention will be worth it once the spring temperatures come back. We recommend using our custom blended fertilizers for your landscape needs as they are specifically formatted for our soil and weather conditions. During the cooler months it is important that you update your watering schedule and lessen the watering frequency. This allows trees, plants, and even your lawn a chance to develop strong deep roots that will encourage more growth come the following spring. This also creates a landscape that is less susceptible to disease and infestation from any insects that might be around. It is important to still continue watering deeply each and every time you water and remember that different plants will require different watering frequencies. Fall and winter are great times to be planting your winter veggies and annuals in Phoenix. That’s plenty to keep you busy this growing season! These should all be planted or transplanted now and fertilized once a month while they are growing. These need to be watered regularly and given a chance to dry out in between each watering cycle. This will help them develop good strong roots through post production. This fast-growing water-wise tree is an excellent option for those water-conscious homeowners looking to add shade and color at the same time. 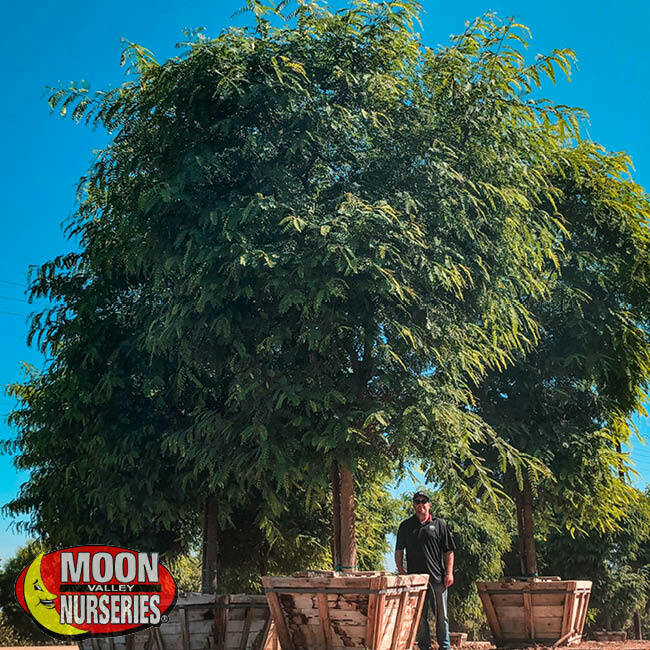 The Tipu tree is one of the fastest growing varieties we offer at Moon Valley Nurseries. In time, its upright and open umbrella shaped canopy will provide shade where desired. When it comes to color, its flowers are a golden yellow color and are in abundance around late spring to early summer. It can become drought tolerant once established, and it thrives in cold and hot weather conditions. When you want to add a lot of shade and beauty to your yard, you cannot go wrong with a Live Oak tree! They have dark green foliage and a wide-spreading canopy that can provide a refreshing and large shady spot in the landscape. 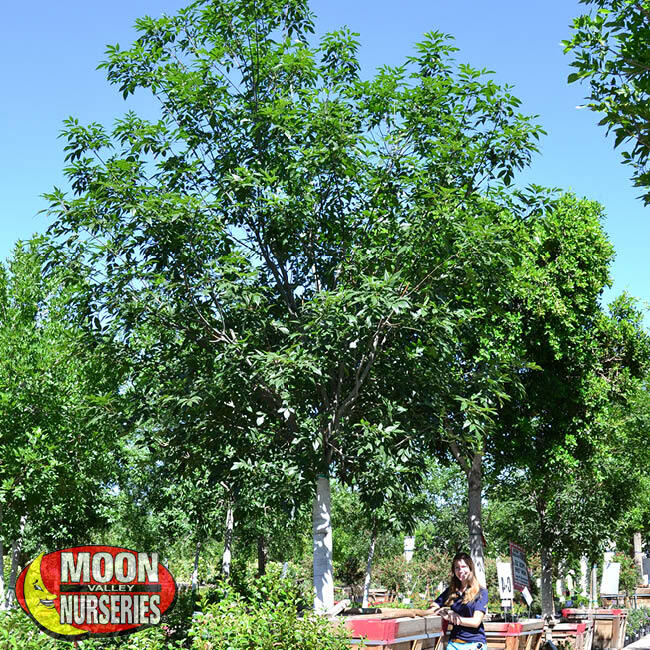 Specimen sized trees are ideal for families – the limbs are just begging to be climbed and explored! You can also create a natural privacy screen when you plant a few of these gorgeous oaks in a row. 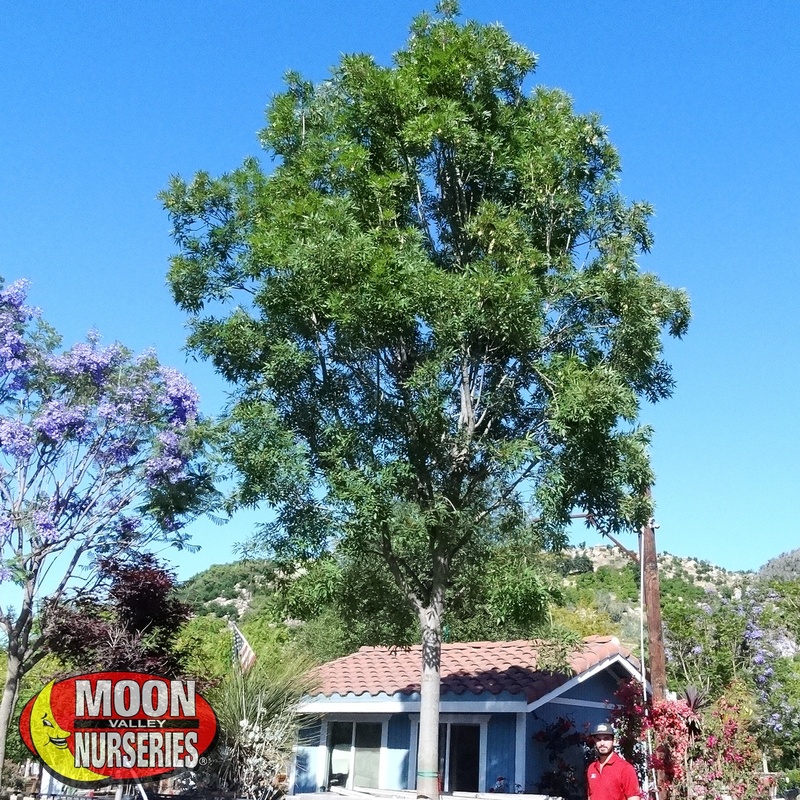 Plant Raywood Ash trees now so they are ready to give you summer shade! As it matures, this large tree grows its bold round-headed canopy shape that can cast the perfect amount of shade to cool down home temperatures and create a refreshing lounge spot in your landscape. These deciduous trees also feature dark green foliage that transforms to an attractive wine-red color in the fall. They do not need much water, but they do love the sun, so they need to be planted in a location that gives them full sun. This vibrant evergreen is certain to give any landscape year-round attractiveness. 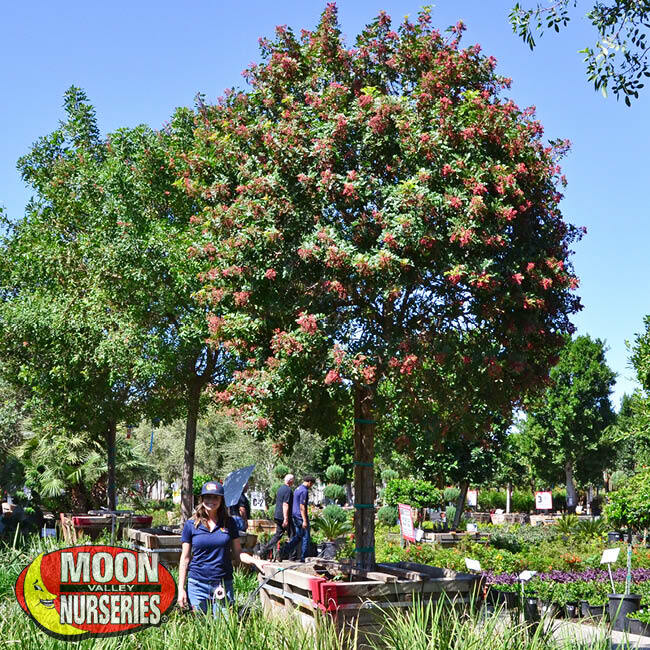 Available in both single or multi-trunk varieties, Brazilian Pepper trees are water-wise and require little water once established. The silky, dark green leaves create a wide-spread awning that creates an abundance of shade. This is a perfect choice for the Arizona desert environment due to its love of heat and its drought tolerance. As a bonus, the Brazilian Pepper tree attracts butterflies, so sit back in the shade and appreciate the wondrous site. Sometimes known as a Shamel tree, they are a favorite throughout Arizona and the Southwest. They are known for growing a large canopy that can create a considerable amount of shade over your yard. They love the sun and have a fast growth rate, so you will not have to wait too long to enjoy the benefits of a mature Evergreen Ash tree. Plant this classic-looking tree to shade a hot side of a home or as a beautiful street tree.